According to Gartner, by 2015 the technology budget of CMOs will likely exceed that of CIOs. There is no question that marketing has become more data-driven and technology-driven than in the past. “Analytics,” “algorithms,” “optimization” – terms that in the past were typically relegated to the cubicles of specialized marketing analysts – are now part of the daily conversation in the CMO suite. Much has been written about audience targeting, programmatic buying, real-time bidding, data management, etc., showcasing impressive advances made in advertising over the past few years. But marketing isn’t just about advertising – that is just one element of the marketing equation. The CMO is tasked with many more responsibilities, including sales enablement, corporate and product branding, marketing mix allocation, website performance and management, not to mention the earned media and social media channels. Along with advertising, these functions are increasingly intertwined around data sets. In advertising, while still early, we are finally starting to see organizations adopt multi-channel strategies, starting with media mix modeling, followed by executing integrated advertising campaigns and finally measuring the effectiveness through attribution. Similarly, online businesses have been improving the linkage between acquiring visitors and converting those visitors to customers through greater personalization of content and offers. Marketing technologies, like ad technologies, have been advancing rapidly in recent years, enabling marketing organizations to operate more efficiently and effectively as well as to improve the customer experience. So think MarTech, not AdTech, for the fuller picture. 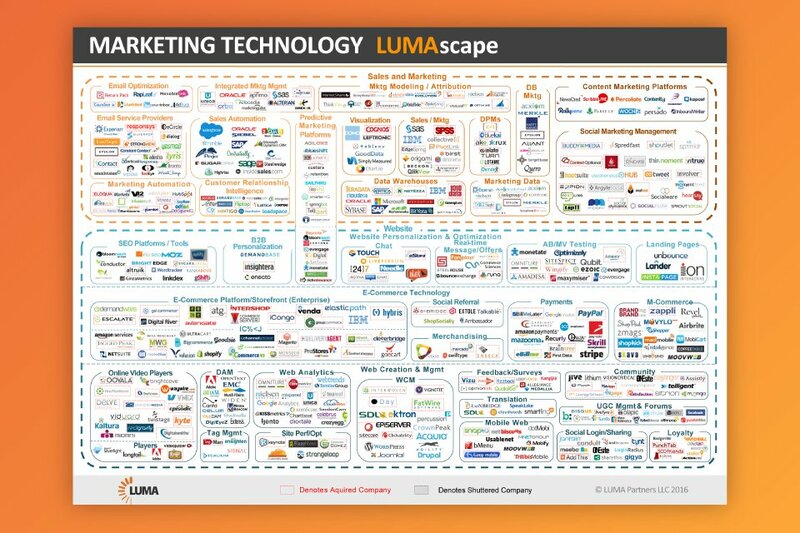 In recognition of this broader marketplace, we are introducing the latest in our LUMAscape series: the Marketing Technology LUMAscape. This latest landscape maps out two categories of software offerings: 1) Sales and Marketing software, and 2) Website technologies. The Sales & Marketing section captures the main categories that marketing departments utilize to plan, execute and analyze marketing campaigns. The Website section includes the technologies to create, manage and optimize websites. Once again, we note that our LUMAscapes are not perfect but rather a continual work in progress. If you have any comments or suggestions, please email us at LUMAscapes@lumapartners.com.